When the image of your meeting room reflects the high standards of your business, select Meeting Plus. Blending contemporary design with uncompromising durability, Meeting PlusÍ style and construction will adhere to your meeting and training environments. 16-gauge steel frames and high-pressure laminate work-surfaces connect easily using threaded steel inserts making installation a snap. A selection of four shapes in multiple sizes lets you set up and reconfigure your meeting and training rooms in several configurations. Meeting Plus tables have been redesigned to include two new important features: Cable management and mobility. 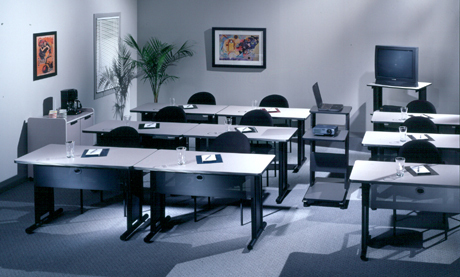 Thesis Training Stacking and Nesting Chairs perfect for meetings, training, conference, classroom and much more. VQV Discount Office Furniture Thesis Training Stacking and Nesting Chairs perfect for meetings, training, conference, classroom and much more.